Hey guys so in this video we're going to talk about the moment of inertia which is really just the rotational equivalent of mass, so in linear motion you have mass in rotational motion you have moment of inertia, you can think of moment of inertia as rotational mass or rotational inertia, the name is tricky moment of inertia sort it's sort of a name from Engineering but don't get confused its just rotational mass let's check it out. So, you might remember that when we solve the motion problems which were those problems we solved with the 3 to 4 motion equations or kinematic equations those equations didn't have a mass in it, right? So they did not depend on mass but once you moved into energy problems or force problems dynamics problems mass was important so here is kinetic energy is 1/2MV squared, gravitational potential energy has a mass, force F=MA that has a mass as well so before we can talk about energy in rotation in forces in rotation we have to talk about mass in rotation because it's a little different, again linear motion mass and rotational motion we have this new thing that we're going to talk about, I want to quickly remind you that mass is the amount of resistance to linear acceleration, linear acceleration is A, mass is resistance to A and we call that inertia when you resist acceleration you're resisting change in velocity resisting change is inertia, inertia means you want things to keep going the way they're gone you want to resist change, I can show real quick how this looks like sum of all force = MA, I can rewrite this as A equals sum of all forces over M, so notice that the greater my mass the smaller my A, right? So, the more mass I have the more resistance and remember resistance is inertia the more mass the more inertia so we say that mass is the quantity of inertia this is old stuff, mass is the quantity of inertia. Well it's going to the same thing in rotation, in rotation the only difference is that in rotation the amount of resistance depends on mass and depends on something else, in linear motion depends only on mass but in rotation it depends on mass and it also depends on distance to axis so if an object spins at a distance of 10 it's going to have a different resistance than if it spins at a distance of 20 from its axis of rotation, OK? So, if you go like this you have less inertia than if you're going like this, OK? 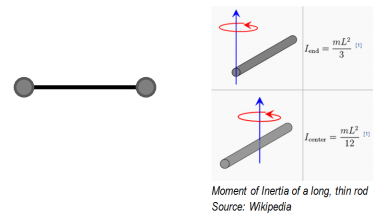 So, this combination of mass and distance to axis is what we call moment of inertia and it's the amount of rotational inertia that you have, moment of inertia takes the letter I you can think of this as just inertia, right? And it's the rotational equivalent of mass, cool? And again, you can think of it as rotational inertia or rotational mass, cool? So, depending on the kind of problem you have if you have motion, linear motion or any kind of linear problem you use mass if you have any kind of rotational problem you're going to use rotational mass which is called moment of inertia, cool. There's two types of objects and two types of problems you can see, you can have point masses again a point mass is a tiny little objects that goes around the circle of radius R and we're going to say that the mass itself has no radius, OK? So remember this distance here is little r, little r is distance big R is the radius so it's a tiny object that doesn't really have a radius it doesn't have a volume, usually you hear something like a small objects and then the other type is when we have a shape or a rigid body these are like a cylinder with a radius or something so the radius here is not 0 and the reason I put shape is because it's usually going to the problems usually that tell you what kind of shape this is, it's a solid cylinder if it says it's a solid cylinder you know it's one of these guys and not a point mass, cool? Now if you have a point mass, the moment of inertia is given by an equation which MR squared and M is the mass of that object and R again is the distance to the axis of rotation, OK? Distance to axis, alright? And if it's a rigid body, I will be given by a table look up what I mean by that? Well your textbook has a table of moments of inertia and it's going to say for a solid cylinder the moment of inertia for example is let me write it here for a solid cylinder the moment of inertia is 1/2 MR squared so this will be given to you most professors don't require you to memorize this they'll give this to you in some way, alright? So, look through your book find a table it's got some pretty shapes, something like this I pulled this from Wikipedia it shows you the shape and it shows where it's rotating, OK? I want to point out that if you spin here if you spin this object at the end of the object so imagine that you're spinning sort of like here, right? At this edge right here so it's doing this it's different than if you're spinning it in the middle like this, notice how these equations are different this is 1/3ML squared and this is 1/12ML squared it's because for moment of inertia where you spin matters, OK? One last point here is that the most moments of inertia will follow this general form here it will be some fraction like 1/2 or 2/3 or 2/5 or whatever MR squared, in this case this is a thin rod so what matters in the rod is not the R not the radius of the rod because it's very thin so it's small it's negligible but it's the length of the rod but even then you see that it's instead of MR squared it's ML squared so you should expect to see something like that, OK? So, we're going to do this quick example here so you see how this works and then we'll do a practice problem. It's says system is made of two small masses the one of the left right here it's this guy has a mass of M let's call it M left= 3 and then mass on the right M right=4 and they are attached to the ends of a 2 meter long thin rod so it's this guy right here, I'm going to write it like this length = 2 meters that is massless so it's a thin rod that has no mass at all and we want to calculate the moment of inertia of the system if it spins about a perpendicular axis through the center of the rod there's a lot of words here and you're going to get used to this but I'm going to start slowly here, OK? So, I want to in the moment of inertia I=? of the system let me put a little system here moment of inertia of the whole system if it spins so it's spinning about a perpendicular axis you're going to see this all the time perpendicular axis, perpendicular means 90 degrees, Perp=90 degrees this is a remember the symbol for perpendicular, cool? So, what does it mean it's a perpendicular axis? Well here's the rod, right? Perpendicular axis means it's making 90 degrees with the rod so it looks like this, cool? Like that, now this is also perpendicular because it's also making 90 degrees so sometimes it's hard to tell which one so you have to be careful so it says perpendicular axis through the center of the rod so it means it's perpendicular makes 90 degrees and it goes like this, you can have a perpendicular axis or you can have a parallel axis, parallel axis would look like this it would go with the rod but then the rod is just spinning around itself and that doesn't do anything, OK? So, the axis will be like this through the middle which means the rod is spinning around itself like this, OK? So, it's a very visual chapter a very visual topic so I'm going to draw it like this and the idea is that this guy is spinning around itself like this, OK? The moment of inertia of a system is the sum of the individual moments of inertia, OK? So we have 3 objects but the rod has no mass and look at the moment of inertia, moment of inertia is either 1/2MR squared or if you are shape it looks like this, both of these guys have masses what it means is that if both of the them require mass so if you have no mass you have no moment of inertia, moment of inertia is rotational mass if you have no regular you have no rotational mass either so what that means is that we're only going to really have two guys, I left + I right, OK? So now we're going to expand this, what goes here and what goes here so what goes here and what goes here? Now you have to decide or you have to figure out are these masses a tiny point mass or are they sort of a bigger shape and here it says two small masses, small is a hint that these are point mass PM points masses which means the equation is an MR squared, OK? So, there's two clues here one it says small that's a dead giveaway and the other one isn't it didn't indicate a shape so if I tell you a small solid cylinder it's still a rigid body because I said that it was a solid cylinder I gave you the shape here I tell you it's small and I don't give you a shape it's a point mass, OK? So, what we're going to write here is M of the left R left squared because that's the equation MR squared, same thing here MR squared but this is for the right, OK? So, the masses are a 3 and a 4, 3 and a 4 so I like to set up.... Whoops This is a 2 right there I like to set up this way what I've done is I've written the mass here, mass here, this mass this mass and I've left the space for us to plug in the Rs, OK? I left a space for us to plug in the R this is where you have to slow down make sure you find the right number, R is the distance between the object and its axis of rotation so it's not the two R is this so this is R for the right ball or right object and this is R for the left object the distances are one for both because it sits right down the middle so it's going to be 1 and 1, OK? 1 squared is just one so the answer here is simply 7, now let's talk about units because we haven't done that yet if you look at I=MR squared which is the I for a point mass the units are going to be kilograms because of the mass and meter squared because of the distance squared, distances is in meters so it's going to be 7 kilograms meter squared, alright? That's it for this one I want to point out that we actually didn't use this table, right? We had a rod here we didn't use this table because this rod didn't have a mass, if it had a mass you would have used this equation right here, OK? You would have used this equation here and I'm going to write here but no mass sad face so we didn't get to use it but you would have used this one because it's spinning around its middle point, cool? That's it for this one let's keep going. Practice: A system is made of two small masses (MLEFT = 3 kg, MRIGHT = 4 kg) attached to the ends of a 5 kg, 2-m long thin rod, as shown. Calculate the moment of inertia of the system if it spins about a perpendicular axis through the mass on the left. Hey guys so as you know the Earth is rotating therefore it has a moment of inertia and if we make some assumptions about the shape of the Earth we can actually calculate the moment of inertia of the earth let's check it out, so it says here Earth has a mass and radius given by these big numbers and they also tell you that the radial distance between the Earth and the sun is this, what I mean by a radial distance is that if the Sun is here the Earth spins around the sun and this distance here little r is 1.5x 10(11) squeeze it in there, that's what I mean by that and then I gave you the mass of the Earth and the radius of the Earth as well I want to know the moment of inertia of the earth as it spins around itself and as it spins around the Sun, as you know the Earth has 2 motions and we can calculate a moment of inertia about or relative to those two motions or for those two motions, remember moment of inertia depend on the axis of rotation that's why these numbers will be different so if you want a moment of inertia of the Earth around itself you would have to treat the earth as an object with a significant size you can't treat it as a tiny object so what we do here is we're going to treat the earth as a solid sphere So the Earth is a big ball that spins around itself. Now technically it's at an angle like that but it doesn't really matter you can just do this, OK? So, it's spinning around itself and your book would show you that solids sphere have a moment of inertia given by this equation right here so when I tell you solid sphere I'm indirectly telling you hey use this equation for I, OK? So, for A part we're going to do part A is over here, we're going to say I= 2/5 MR squared and all we're going to do is plug in the numbers here so M is the mass of the earth which is 5.97x10(24) and R is the radius of the earth which is this and not the radial distance, it's the earth going around itself so it's the radius of the actual object or the sphere, 6.37x10(6) squared, OK? If you look at this number I got a 24 and then I got a 6 squared so you should imagine that this is going to be a gigantic number and it is I multiplied everything I get 9.7x10(37) kilograms meter square, the Earth has a lot of inertia and what that means is that we're being incredibly hard to make the earth stop spinning, OK? Now if you were to google this number you would see that it's actually a little bit off the actual moment of inertia is a little bit off and that's because the earth is not a perfect sphere it's got different layers it's not even a sphere so but this number is a pretty good approximation. For Part B we want to find out what is the moment of inertia of the earth as it spins around the sun, now in this case relative to the Sun the Earth is tiny so we're going to treat it as a point mass which is crazy the earth is huge thing and you're going to just treat it as a little point mass of negligible radius and that's because relative to the Sun the Earth is negligible in size, OK? So, I'm going to put the earth here as a tiny M earth and it's going around the sun and the distance here the radial distance which is little r, big R is radius of an object and little r is distance to the center is 1.5x10(11) meters in this case we're going to use instead of 2/5 MR we're going to use MR squared because the Earth is being treated as a point mass here, M is the mass of the object itself, right? It's the object that spinning it's not Sun so it's going to be 5.97x10(24) same thing but r is going to be the distance to the center which is 1.5 so 1.5x10(11) squared I got a 24, I got an 11 squared this going to be again a gigantic number, 1.34x10(47), this number is like a billion times bigger than the other number, right? So as hard as it would be to get the earth to stop spinning it would be way harder, right? It would be 10 to 10 times harder to make the earth stops going around the sun, and that's it so that's very typical classic problem hopefully it makes sense you should try this out on your own and let's keep going. Practice: A solid disc 4 m in diameter has a moment of inertia equal to 30 kg m2 about an axis through the disc, perpendicular to its face. The disc spins at a constant 120 RPM. Calculate the mass of the disc. Calculation error. Should be 5.49x1043 kgm2. Hey guys, so here's another pretty straightforward moment of inertia question the only difference here is that we're going to have density to deal with so let's do this real quick. So, it says we have a planet that is nearly spherical, nearly spherical means that it's a sphere, OK? So you can basically ignore the word nearly It means we're going to approximate it as a sphere with nearly continuous mass distribution, again you can ignore the word nearly and assume that it has continuous mass distribution, continuous mass distribution we'll talk more about this later but it basically means that a sphere has the mass evenly distributed throughout the sphere so you sometimes you see drawn like something like this, this is a solid sphere and this is opposed to a hollow sphere which is a sphere that has nothing inside, it's not continuously or evenly distributed all the mass is concentrated on the edges this is not what we have here this is what we have here the reason why that's important is because you're going to get a different I equation a different moment of inertia equation depending on what kind of sphere you have and the moment of inertia equation for this guy here is 2/5MR squared, the question didn't give you this but you would look this up in your book or in a test he would have to give you this somehow unless your professor requires you to memorize these and then you have to do that but most of them don't, alright? So that's the equation you're supposed to use I give you the radius right here radius is 8x10(7) meters and I give you the density, density you can use D but the official variable if you will is row, right? It's 10000 Kilograms per cubic meter, I want to remind you that if you have a volume the density of a volume is mass over volume and you could have seen this from the units kilograms cubic meter, cube right so it's a volume it's a three dimensional object, and that's it that's all we're given I also give you here the equation for volume of a sphere, volume right here of a sphere, now if you were looking for I and if you start plugging stuff in here you would realize you don't have M but you have R, OK? So we don't have M we got to figure this out and if you look around you, you realize well we have another piece of information that has some connection to M so maybe I can use this to solve for M and that's exactly what we're supposed to do so I want to find M I have 10000 but I don't have a V but once again I have another piece of information here that allows me to find the V, V= the volume of a sphere= pie r cubed and I know, I know r so I can get V I'm going to V so I'm going to be able to get M I'm going to know M o I'm going to be able to get I, OK? That's how it's going to flow. Alright so what I'm going to do is right here I'm going to solve for M in other words I'm going to move V over here so M=10000V and V is according to this equation right here 4/3 pie r cubed so I'm going to get this whole thing which is M and I'm going to stick it in here, OK? So, 2/5 x 10000 x 4/3 pie r cubed, this is just M and then I also have the R squared here, tons of Rs, OK? And if you multiply this whole crap you're going to end up with let's see this is 18...I'm sorry this is 8 so this is going to be 80000/15 so it's 80000 pie, did I get that right? Yep, divided by 15 times r to the fifth, these two guys combined R to the fifth so it's going to be 8x10(7) this thing to the fifth, OK? So, you should expect a pretty big number and I get 3.15x10(45). Now how exactly do you arrive at this number doesn't really matter it's I so it's kilograms meter square you could have you know gotten a number here plugged it in here it really doesn't matter as long as you're right here it's a bunch of multiplication, cool? So that's it for this let me know if you have any questions.